Facebook is a tremendously powerful marketing tool for business, however, it also contains a lot of traps and mistakes which brands can commit. The key to a successful Facebook marketing is doing it right, and knowing which things are a big no-no. If you would commit them, they can be severely damaging to your brand. Therefore, it’s important that you are extremely careful with what you post and how you use the platform as a marketing tool. If you’ve been using Facebook for years and still use the same marketing strategy, it is time to learn how Facebook now works, and tweak your current strategies, as they are constantly changing the platform. If you’re looking to start with marketing just now, knowing what dangers are out there will help you better set up your strategies, and in that way dramatically increase your chances of success. In this article, I’ll present you with the Top Mistakes Businesses Make When Using Facebook for Marketing, so you can avoid committing them, and use Facebook with confidence. When Facebook marketing was relatively new, Facebook didn’t know much about ads, and they certainly didn’t have all the targeting criteria that you have today. The explanation of how brands generated results with ads was the more likes & shares, the better. However, that was not true then and is certainly not true now. Because they ultimate end goal of a marketing campaign is always increased sales. And a number on your follower/like counter is just a number if your audience doesn’t do anything. Therefore, getting new followers should (almost) never be the main objective of an ad campaign, followers are rather a bi-product of a successful marketing campaign. Moreover, brands and marketers should never spend their efforts in getting as much “likes” and “followers” as possible, instead, they should aim at making a big of an impact as possible, while also building relationships and trust. Because that is what ultimately will lead to a sale. Remember: (Almost) never focus on only followers/likes, instead focus on providing value and building trust. Back in the days, sharing content and growing your page with the help of organic growth was possible, but now, things are different. As more and more people started to use Facebook (brands included), the platform rapidly became saturated. If Facebook would still be using a chronological feed and show you everything that everyone posted in your feed, it would take you hours, maybe even days to go through it all. To offer the individual users a more pleasant experience, Facebook has therefore limited the organic reach heavily over the years. 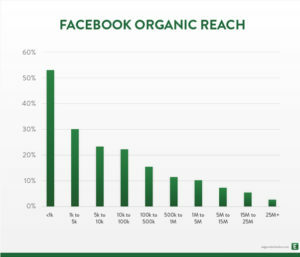 Facebook limiting the organic reach has been a discussed subject, and it has caused a lot of anger. Some have even said that the only reason to the limited organic reach is because Facebook wants to make more money by forcing brands to buy Ads. While this is debatable, Facebook denies these allegations. Some brands still believe that only sharing content on the platform is enough from a marketing point of view, but today, boosting your posts (or page) with ads has more become a necessity than an option for brands. If you aren’t advertising, you are probably wasting your efforts. If you want people to see your posts, advertising is the way to go. The key to successful Facebook ads is experimenting with a few different ads, and then putting all your money on those that generated the best results. The big mistake a lot of brands commit is to simply make a campaign and start spending. This is the wrong approach to Facebook ads, and by simply optimizing and monitoring your ads, you can generate considerably better marketing results – for the same money. And getting the most bang for your buck should be every marketer’s goal. 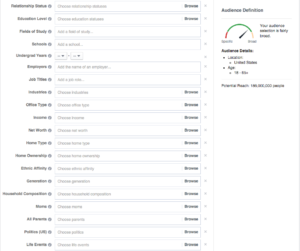 Facebook offers tools where you can monitor your ads and how they perform – so use them! You shouldn’t rely on just one campaign, instead, you should set up a bunch of different, yet similar campaigns with slightly different targeting. For example different age groups, different interests, and demographics. Once you’ve run a few campaigns, you’ll learn what generates better results than others. Simply cut the bad campaigns out and continue with the more successful ones. But whatever you do, never stop experimenting and making tweaks to your campaigns. And always, always monitor them. People don’t want to read a status update with pages and pages of text. They want you to get to the point quickly. The last thing you want to do is waste their time. 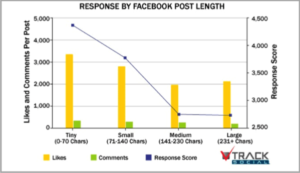 Posts on Facebook with 250 characters or less get 60% more shares than texts with more than 250 characters. If you go even further and keep it below 80 characters, you can get even more likes. Your Facebook profile is the first thing that people will see when encountering your brand. Therefore, you want to complete it and fill in all necessary information. The more information you include, the more professional your business page will look, and thereby, you’re increasing the chance of people becoming interested in your page. Not completing your profile will have the opposite effect. It will make your page look abandoned and not very professional – thereby decreasing the chances of people becoming interested in your page.